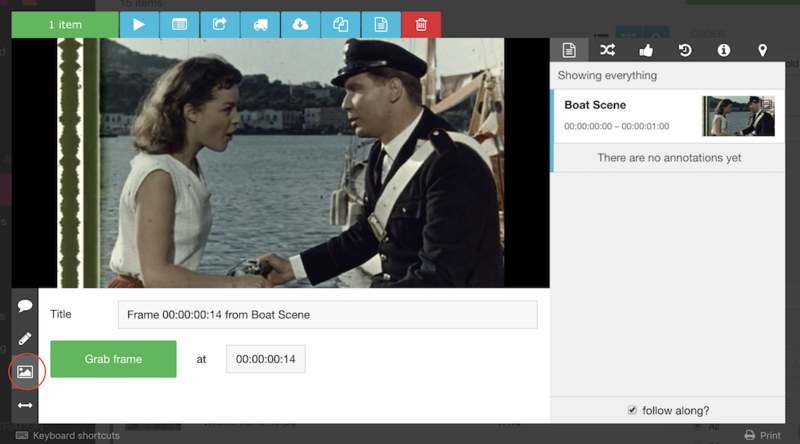 When looking through your video clips you may want to use some of the frames to highlight an item or create GVs and Aframe&apos;s Frame Grabber lets you do that. This tool will allow you to grab a frame and create a jpg file from any frame within the video. All you need to do is select the video you would like to grab the frame from and review/play it. This will open the review window and you will see the tool in the bottom left, as shown below. 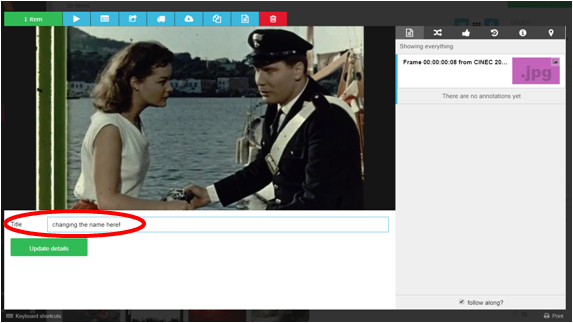 Once selected, play the video as normal and to choose the frame, you can either select the title text window (which will stop the video) or you can use the timecode box. When using the timecode box, you can move the hours, minutes, seconds and frames with the cursor up and down keys. Once you are happy with the frame, select the green &apos;Grab frame&apos; button and Aframe will begin creating your JPG file. To see your file, exit the review player. Once your file is created, it will appear as any new media is added to the project, with a &apos;New media available&apos; banner. The preview of the image will then be created. You will see that the new jpg retains the original filename, along with with an extra unique frame identifier. Maybe you would like to change the display name of your newly created jpg. To do that, simply select the file and press review/play. Once in review, select the title text box and edit it, then choose &apos;Update details&apos; and you are done. You can share this or download, just as any other file. Note: The jpg file is created from the original file, so the better the quality of the video, the higher the quality of the image. The only exception this is camera cards, where the image is extracted from the HD proxy or SD if no HD available. This tool is a user permission, so admins can be enable or disable this feature at account, organisation, project or individual user level. The ability to change is &apos;Users can change media title and summary&apos; ability. Note: removing this ability will also disable the subclips feature.